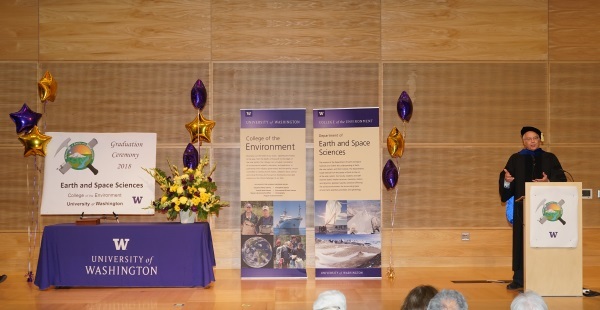 On Saturday June 9th, 2018, over 400 people gathered in the HUB Lyceum on the University of Washington Campus to celebrate the UW Dept of Earth and Space Sciences annual Graduation Ceremony, hosted by Chair Bruce Nelson. Receiving diplomas were 46 undergraduate students, out of a graduating class of 85. Receiving hoods were 9 out of a class of 12 Masters students, and 9 out of a class of 13 PhD students. 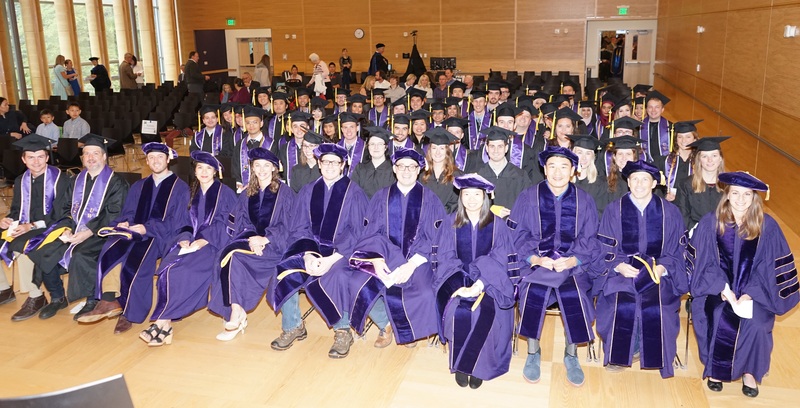 This is one of our larger graduating classes so we again held the ceremony in the HUB Lyceum auditorium with seating for 400, as our previous locations in Johnson Hall and Bagley Hall are not adequate. In addition to the live audience, this ceremony was witnessed by 102 live videostreams to six countries around the world. A reception was held in the HUB Lobby outside the Lyceum following the ceremony. 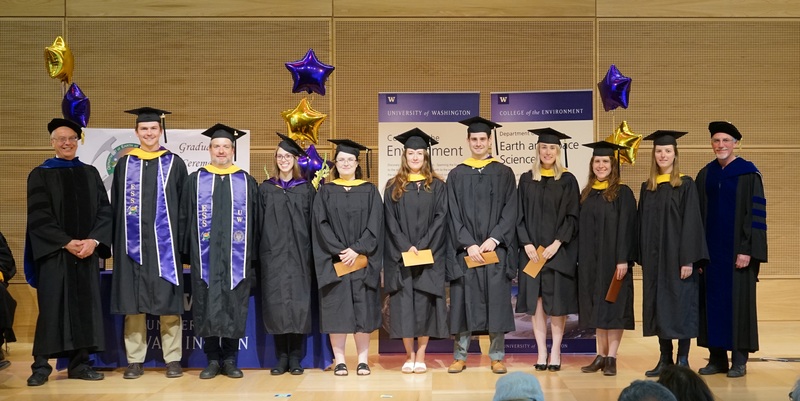 Speakers for the 2018 Graduation Ceremony included UW ESS Chair Bruce Nelson, UW College of the Environment Dean Lisa Graumlich, and special guest speaker Dr Michael McGroeder (PhD UW-Geology 1988), currently Retired Research Geologist with the Exxon Corporation in Houston Texas. 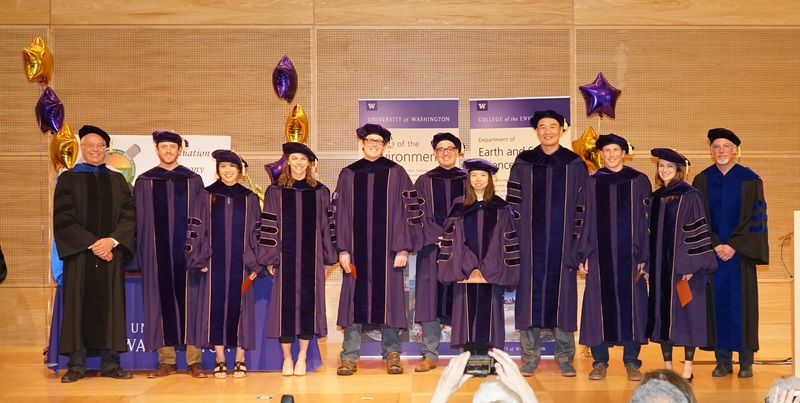 Student speakers include Dr. Shelley Chestler for the grad students, and undergrad Madeline Hille. The Graduate Student announcer was Ken Creager, and the undergraduate student announcer was Gerard Roe. The video recording of the ESS 2018 Graduation Ceremony can be viewed as a live stream (2 hours), or you can choose to download and save the 876MB mp4 video. ( .mp4, 876MB, 1 hour 50 min 53 sec ).